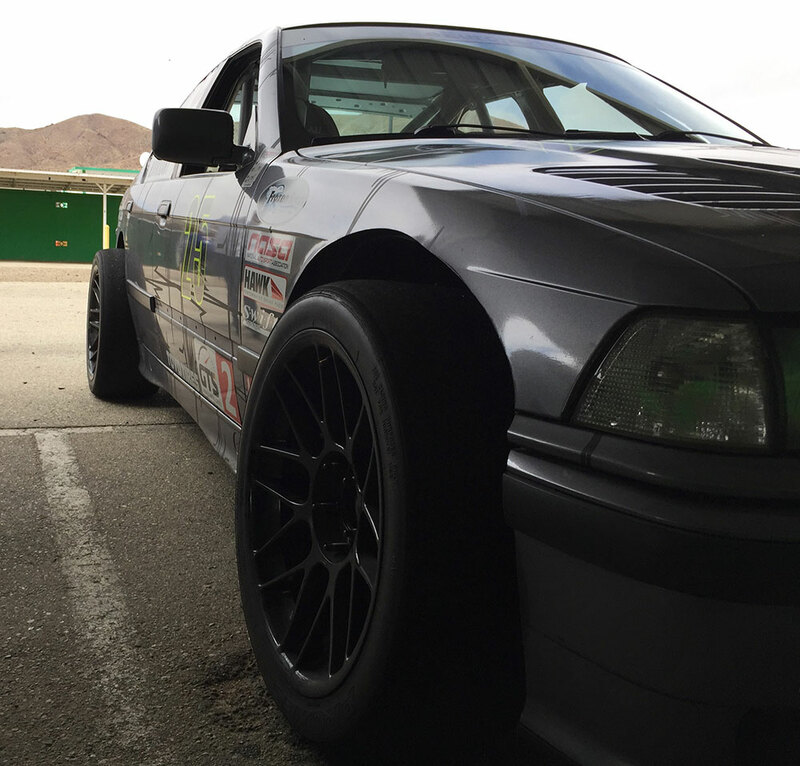 Now this is racing – B25’s E36 is back on track with big changes! 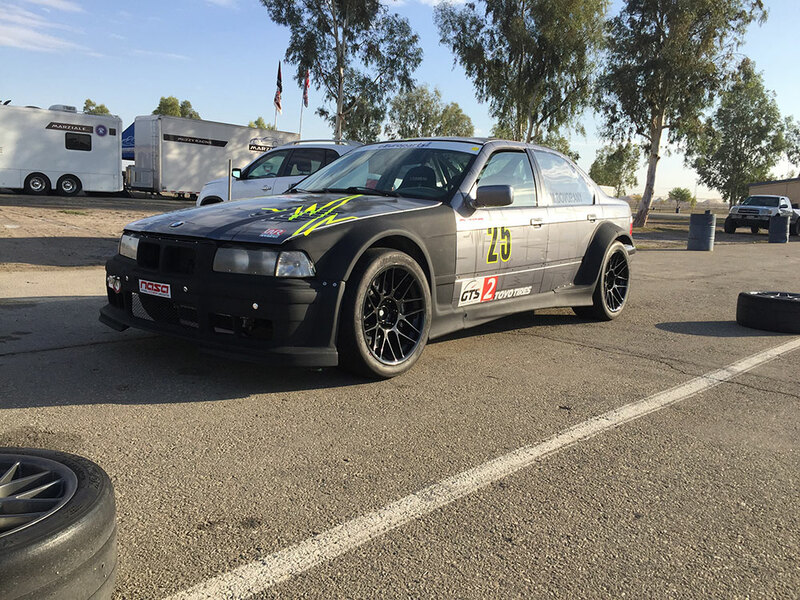 Almost two years to the day after we earned a podium spot in NASA’s Championships, we returned to Buttonwillow with a car that was dramatically transformed. The goal: to see if our hard work had paid off. But first, just what had we done? 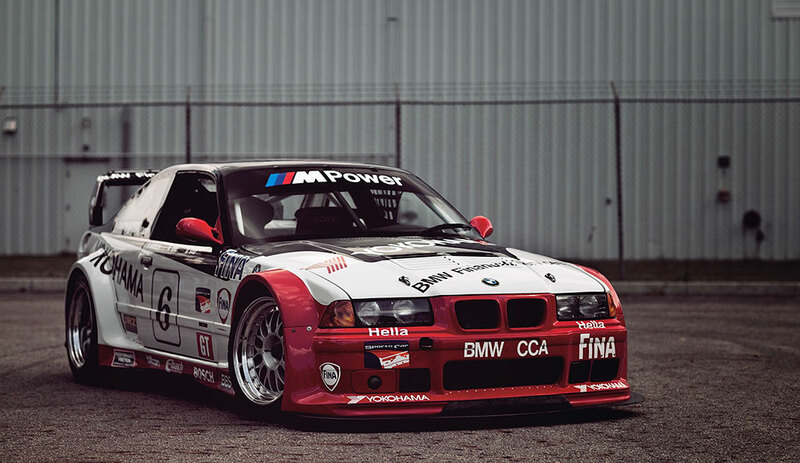 BMW’s dominant PTG cars of this era came to the party with loads of horsepower. But that wasn’t all. They were proper widebody cars (see photo below of one of those cars). Our rules penalize power with weight, so that wouldn’t work. But the track width was free. So we went for it. Under the advisement of a seasoned chassis engineer and championship-winning NASCAR engineer, we widened our suspension, a process that required a slew of custom parts and modifications that would make BMW engineers roll over in their graves. We had to cut off our fenders to create room for our wider suspension and 10” wide wheels sporting 285 tires. 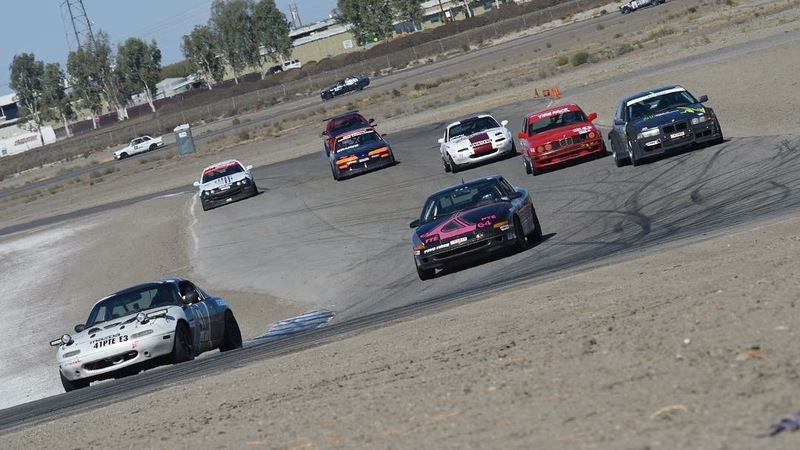 So most of this year was spent modifying a PTG widebody kit – available for coupes only – to fit our sedan. 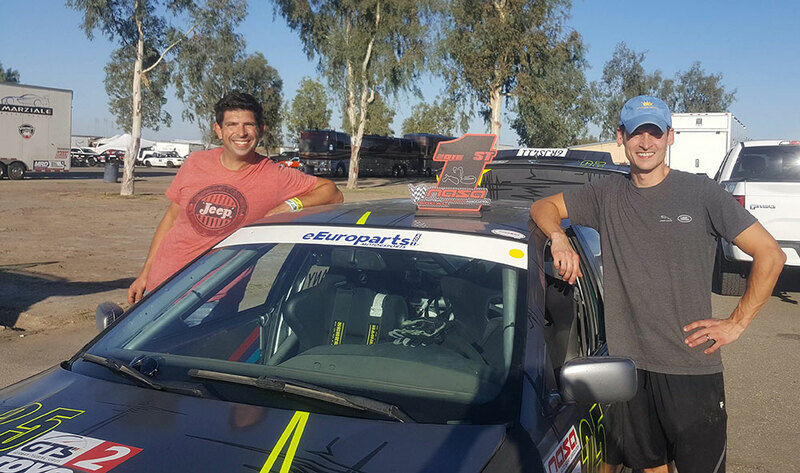 The day before the race, we arrived at the track with a car that – other than being aligned – was in no way properly set up. We knew our times wouldn’t be ideal, but we were hopeful to see how much faster the car was. Our first run showed promise. Without even trying, we clocked a 2:06 flat. Our previous best was a 2:07.9. Then that’s when things got interesting. Our crew chief had the car out for a recon run when an overly exuberant exit onto the front straight resulted in a spin and heavy hit on the pit wall, with ultimately 3 sides of the car making contact with the wall. We were deflated. But – as this was the last race of the season – we worried that if we just packed the car up and went home that sour note would plague our whole offseason. 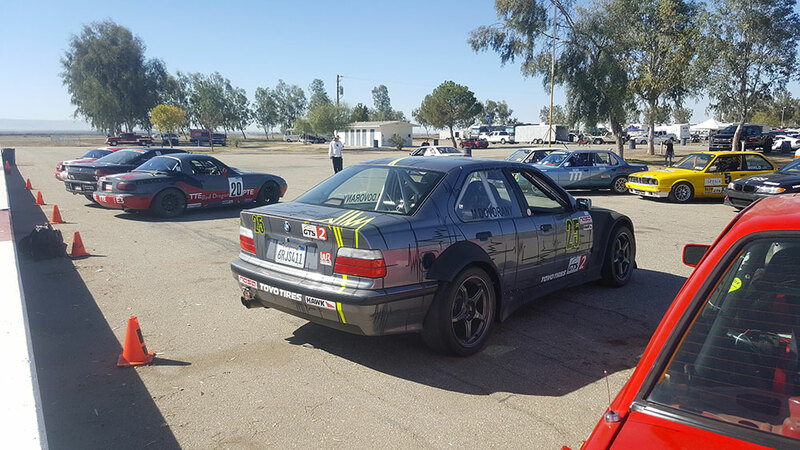 We limped the car back to the pits where we discovered – aside from the bashed body kit and sheetmetal – a broken front wheel, tie rod, and bent steering rack. With what we hoped was an accurate assessment of the damage, we hit the road, calling dismantlers, dealerships, and local parts stores to get everything we needed. If only eEuro was closer, they had nearly everything we needed. 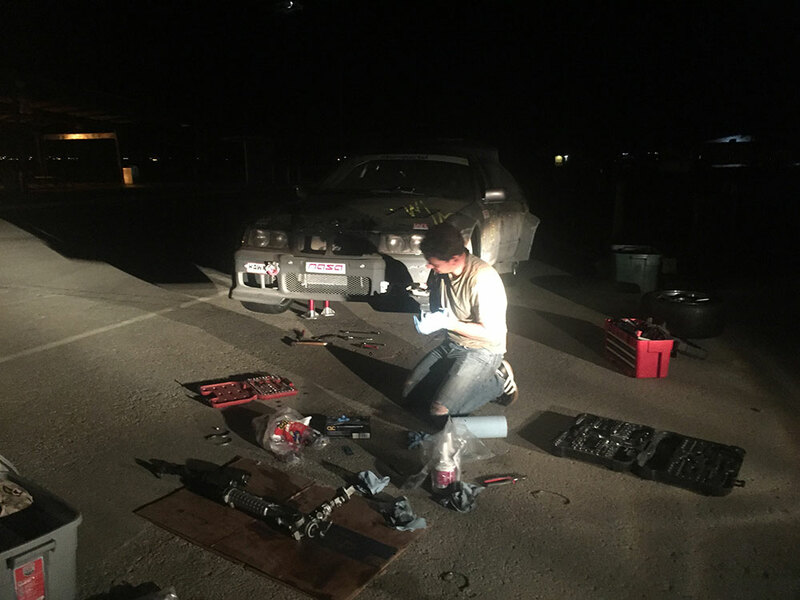 8 hours later, after several hundred miles of driving, we arrived back at the track just as the sun went down and got to work. Hours later we completed our work, setting toe as best we could with a tape measure. We had no idea if the car would even be able to turn a lap the next day. The day of the race, we drove the car around the pits, then cautiously headed out for the first practice session, where after a couple of laps we were already getting into the 2:05s. Our team was cautiously optimistic. The harder we pushed the car, the better it felt. We qualified on the pole. For the main race, we not only won, but we saw times in the high 2:04s, setting a GTS2 lap record in the process. This, on a car with the steering wheel pointed the wrong way, way too much negative camber, and a suspension that – due to the higher cornering loads – was engaging its bump stops midcorner.